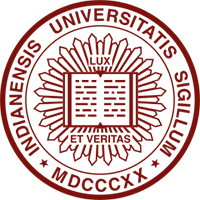 The Indiana University Bloomington Department of Physics is a medium sized department with an undergraduate program that has doubled in size over the past five years. They currently have research going on in particle physics, nuclear physics, astrophysics, cosmology, and others. 1951 – 1954Kenneth Watson was on faculty. 1951 – 1955Keith Brueckner was on faculty. 1956 – 1958Riccardo Giacconi was on faculty. 1960 – 1962John Bahcall was on faculty. 1970 – presentRobert Pollock has been on faculty. 1973 – 1984Gerald Mahan was on faculty. 1980 – presentCharles Goodman has been on faculty. 1987 – 2000Allan MacDonald was on faculty. 1987 – 2001Steven Girvin was on faculty. Department information from Indiana University Department of Physics's website (http://www.iub.edu/~iubphys/). Assistant Professor of Physics and Associate Professor of Physics. Postdoctoral Researcher; Professor of Physics; and Distinguished Professor of Physics. Professor of Physics and Distinguished Professor of Physics. Distinguished Professor of Physics and Distinguished Professor Emeritus of Physics. Allen V. Buskirk lecture notes for classes of Emil Konopinski and Oppenheimer, undated. In memoriam--Daniel Kirkwood, 1814-1895 [videorecording] / Indiana University Television Educational Services ; executive producer, Frank K. Edmondson ; producer and director, John Winninger. Kenneth William Ford narrative, 1965. Mason E. Hufford papers, 1853-1952. Oral history interview with Emil Jan Konopinski, 1982. Oral history interview with Kenneth W. Ford, 1997 November 15 and 22. Oral history interview with Lawrence M. Langer, 1982. Oral history interviews. High-Energy Physics. Selected Experiments: SLAC-E-103: Search for Exotic Mesons Using the SLAC Two Meter Streamer Chamber, 1989. Oral history interviews. High-Energy Physics. Women in High-Energy Physics, 1991. Roger G. Newton papers, 1955-2003 (bulk 1970-1990). Roger G. Wilkinson papers, 1921-1968 (bulk 1937-1960). Wesley C. Salmon papers, 1934-2002 (bulk 1963-2001).